The timeless and classic beauty of hardwood flooring makes it ideal for any household. If you are interested in enhancing your space with a durable and attractive floor solution, look to our local store. We offer a wide range of wood floors that guarantee to fit in perfectly with your household décor and style. Choosing your favorite hardwood floors is simpler when you shop with us. Our full-service showroom carries a wide selection of solid hardwood flooring and engineered hardwood flooring that matches your design preferences. From oak and cherry hardwood, to mahogany and redwood, we carry products that will complement your interior design plans. Create a distinct ambience throughout your home with hardwood floors. Hardwood has long been revered as a traditional flooring option due to its natural appearance, rugged resiliency, and sheer visual appeal. Homes with these floors enjoy higher property value and prestige, and the distinct feeling and sound underfoot creates a sense of majesty throughout your home. For your next home renovation project, consider hardwood and make an investment that will serve you faithfully for years. Traditional, unfinished hardwood flooring is installed prior to the staining and sealing process. Finishing the planks once they are installed results in a customized look that is completely unique to your home. In order to deliver the lowest prices possible on products from industry-leading brands, we utilize the buying power of our parent company. As a result, you gain access to a wide array of stunning designs from well-known manufacturers and brands. What many homeowners fail to realize is that for their wood flooring to look and last the way they desire, it must be installed properly. Our staff includes a team of technicians that have years of experience in hardwood flooring installation. When you hire our technicians, we ensure your investment serves you well. We carefully measure your project site, remove your old flooring, and place your selection. Our services may be tailored to accommodate your schedule and budget. To prove our commitment to your satisfaction, we back all purchases and completed installations with a promise called the Ultimate Confidence Guarantee. If you decide that you are unhappy with your new flooring within 30 days of the install, we promise to replace it with a comparable product free of charge. In addition, if you are not satisfied with our installation service, we will gladly correct any errors at no additional cost. Creating a unique atmosphere in your home is simple with our solid hardwood flooring. As the name implies, this flooring is crafted into complete planks, which impart an unmistakable sense of sturdiness and visual appeal to any home. It is a sensible investment that is sure to last for decades with the proper care and maintenance. This option also accommodates many different visual themes, such as rustic, contemporary, modern, craftsman, traditional, Victorian, and bungalow. Any gouges or dings that occur on the surface may be sanded and refinished by a flooring technician. These repairs are easier on the wallet than fully involved replacements, which make solid hardwood a solid choice in terms of sheer staying power and dependability. In addition to offering unfinished materials, we offer a variety of affordably priced prefinished hardwood flooring that is perfect for any interior makeover. These floors feature stained, sealed, and finished planks that make for an easy installation, which enables you to enjoy them shortly after we deliver them to you. Advances in the design and manufacturing of prefinished hardwood mean that the latest products will hold up under everyday use better than ever before. When you shop for hardwood flooring with us, you can feel confident knowing that your new floors will look great and last far into the future. Looking for an environmentally friendly flooring option that reflects a sense of classical elegance and beauty? We recommend engineered hardwood flooring, which is composed of compressed layers of plywood, and then finally topped with a thin layer of solid hardwood in a species of your choice. As a result, this option provides the visual appeal of solid hardwood at a fraction of the cost. In addition to its cost-effectiveness, this flooring is capable of resisting the warping effects of humidity. This allows you the flexibility to remodel your home as you see fit, all without limiting your selection of available materials. Engineered wood floors are an investment that stays in pace with your active lifestyle. The knowledgeable associates at our local flooring store are committed to making the shopping experience easy, enjoyable, and stress-free. You can depend on us to educate you about the benefits of each hardwood floor product, ensuring that you feel completely confident when it comes time to make a purchase. 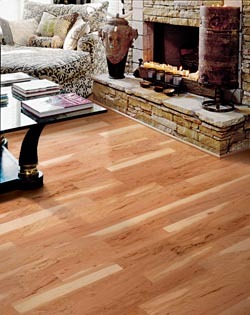 We offer hardwood in a range of different species, stains, and textures, all available in the latest floor fashions. From rustic to modern and everything in between, you can feel confident that we carry it all in our impressive inventory. What many homeowners fail to realize is that for their wood flooring to look and last the way they desire, it must be installed properly. Our staff includes a team of technicians that have years of experience in hardwood floor installation. When you hire our technicians, we ensure your investment serves you well. We carefully measure your project site, remove your old flooring, and place your selection. Our services may be tailored to accommodate your schedule and budget. To prove our commitment to your satisfaction, we back select, 4- or 5-star rated flooring and installations with a promise called the Ultimate Confidence Guarantee. If you decide that you are unhappy with your new flooring within 30 days of the install, we promise to replace it with a comparable product--free of charge. In the event that you are not completely satisfied with the installation service that we provide, we will gladly correct any errors at no additional cost to you. That way, you can rest assured that your new floor will be properly installed in a prompt and efficient manner, so you and your guests can enjoy it as soon as possible. Contact us for more information regarding the hardwood floors available at our store and showroom, visit our location or contact us today. We offer high-end flooring for the residents of New Haven, East Haven, Branford, North Haven, and Hamden, Connecticut.